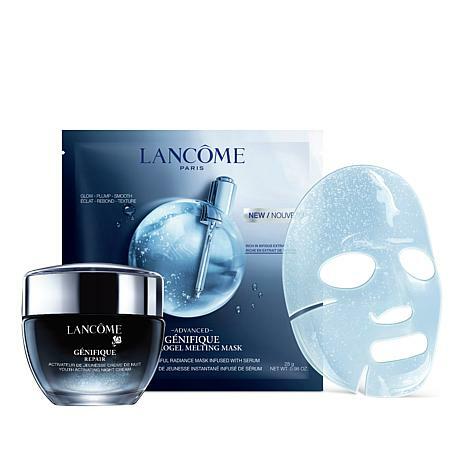 A night cream and gel mask duo formulated to help moisturize and smooth the appearance of skin. Apply your night cream on perfectly cleansed skin every night, after Advanced Genifique, our #1 serum. Remove mask from packet; unfold and apply to face. Let mask sit on y our face for desired time; 10, 20 or 30 miutes. 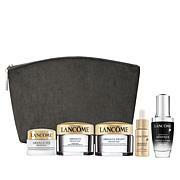 I purchased this kit to compliment my purchase of the Genifique Serum. 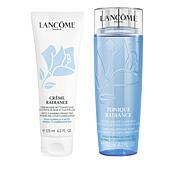 I love the Genifique cream, as it is soft, silky and luxurious. I feel like Im getting a daily spa treatment. Also getting many compliments to my skin. Highly recommend. I can see why they say it is only sold on Paris. They dont want everyone to know how awesome this product is. I have used it for three nights and can makes my skin feel so soft and refreshing. Love it love it !! I have only used this product for 3 nights and even after the 1st night my skin was remarkably softer! I see a difference in the clarity of my skin. I can tell you with great confidence that this product is going to make my skin better than ever! I wish now that I would have purchased more at the price I received! I had a friend feel my face and she ordered it the same day! You can't go wrong with this! I won't ever use anything else again! 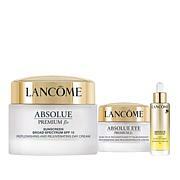 Thank you Lancome!